One of the most daunting parts of visiting Boston for the first time is figuring out how to navigate the city’s public transportation: the Massachusetts Bay Transit Authority’s (MBTA) subway and bus system, commonly known as the “T.” However, once you get a lay of the land and try it out a few times, you’ll likely find that it’s an easier — and more affordable — way to get around. Parking can be hard to come by, so you’ll be happy not having a car if you plan on staying in the city. The T is the United States’ oldest subway system, which started running back in 1897. It’s not particularly nice, but it will conveniently get you from one point to another within the city so you can see even more than you could by foot (though Boston is a walkable city). It also comes in handy during winter months when walking isn’t enjoyable. Fares: A single ride CharlieTicket for the bus is $2 and the subway is $2.75. However, you’ll save on each ride if you load money onto a CharlieCard (for example, save 50 cents per ride on the train). Do some research and determine if it make sense to purchase a 7-day unlimited pass, which you can use on both the trains and busses. There are also monthly passes available if you’re in town for an extended stay. Children under 11 who are with an adult ride for free, along with military personnel, police officers, firefighters and government officials. Reduced fares are available to students and seniors. Types of Passes: There are two types of passes and the best option for you depends on how often you’ll be riding the T, along with the modes of public transportation you want to take. First is the CharlieCard, which is ideal for those that plan on taking the bus and/or train frequently and will give you discounted one-way fares. Oftentimes a CharlieTicket is best for visitors, as they can be bought at any train station and loaded with cash or passes as you need them. While you won’t get discounts this way, they’re also valid on the Commuter Rail and Ferry and will allow you to ensure you aren’t spending more than you need on public transportation. Hours of Operation: Hours will vary depending on the line and station you plan on traveling on, but for the most part, you’ll find that the T runs from 5 a.m. to somewhere between midnight and 1 a.m. Don’t wait until it’s getting close to 1 a.m. to head to the train or bus though — that’s recipe for missing the last one from your station. Boston bars typically stay open until 2 a.m., so if you plan on staying out until they close, you’ll need to take an Uber, Lyft or taxi home. Subway Lines: The T consists of five separate lines, each of which connects at several locations within the city. The Green Line began as America’s first underground subway system in 1897. Today, the line consists of four separate branches (be sure to get on the right one). The other lines are the Red Line, Blue Line, Orange Line and Silver Line. The main stations that you can connect from one line to another are North and South Stations, as well as stops like Park Street and Downtown Crossing. Map out your travels using the MBTA trip planner website, which will help you determine the best options for trip, as well as real-time departure and arrival information. Fare vending machines: Fare vending machines can be found at all subway stations, as well as at the Lynn and Worcester/Union Commuter Rail stations. Here you can buy or renew CharlieTickets and CharlieCards, including 1-day, 7-day, cash value and monthly passes. These machines accept cash and major credit and debit cards, though keep in mind that some will be marked as not accepting cash. Retail sales locations: There are select stores in the Boston area and even Providence, RI where you can purchase a CharlieCard and add cash value or a pass to it or add to an existing CharlieCard or CharlieTicket if you already have one. Plan ahead and find a retail store closest to you. These locations accept cash or credit/debit cards. Online: If you already have a CharlieCard or order one ahead of your Boston trip, you can register for a MyCharlie account and easily add cash value or passes online. This can also come in handy because it protects you if you happen to lose your card somewhere along the way. Sign up for MyCharlie here — or you can load money onto an existing card here without logging in. At street-level stops along the Green Line or Mattapan Trolley: If you’re riding either of these lines, you can add up to $20 cash value on your CharlieCard or CharlieTicket right onboard at these street-level trolley stops. Note that this option does not apply to 1-day, 7-day or monthly passes. To pay at a street-level stop, you’ll need to use cash or coins. Airport Transit: There are two free MBTA options to get from Logan Airport to Boston. First, take the MBTA Silver Line SL1 Bus, which will go to South Station, which connects to the Red Line, Commuter Rail and several busses. Or you can opt for the Blue Line via a free Massport shuttle bus, which will take you right from the airport terminal to Airport Station on the Blue Line. Alternatively, there is a scenic water taxi that will take you to various destinations along the waterfront, but it’s not the easiest option if you’re traveling with luggage. Ferries: The MBTA has two ferry lines that travel to Boston, including the Charlestown Ferry and the Hingham/Hull Ferry, both of which are popular among commuters who live in these areas. Both go to Boston’s Long Wharf, which is easily accessible to many of the city’s hotels and attractions. If you’re looking to visit Boston area beaches, you may want to use the Hingham/Hull Ferry to get to South Shore towns. Commuter Rails to Nearby Suburbs: If you’re not renting a car, the Commuter Rails are a great way to get to Boston area suburbs. There are several lines to choose from that will take you in any direction. Rates will depend on where you are traveling to, as they are priced by zone. Ubers, Lyfts and Taxis: It should come as no surprise that there is an abundance of Ubers, Lyfts and taxis in the city of Boston. Ride-sharing services are oftentimes more affordable than taxis, though some prefer the convenience of picking up a taxi at a designated taxi stand. Bike Sharing: An increasingly popular way to get around Boston is through the city’s Blue Bikes bike share program. There are over 1,800 bikes at 200 stations throughout the city and it’s easy to use – simply become a member online, buy a pass from the app or a kiosk and pick up a bike in a location that’s convenient to you. When you’re done, find a drop-off location, check it in and you’re good to go. Car rentals: Car rentals are certainly available in Boston, especially by Logan Airport, but think about if you’ll truly need one before you book. Most Boston neighborhoods lack ample parking, especially without a resident sticker, so you may end up paying a good amount of money to park it. There are plenty of other ways to get around the city without a car. If you plan on spending a decent amount of time outside the city, then a car rental may be necessary. But you could also explore services like ZipCar to use one for a day, for example, which may offer cost savings. Winter weather causes delays. Bad weather — especially snow — typically impacts public transportation, so plan for delays and resulting crowds. Unfortunately, this is due to the MBTA’s old infrastructure in many cases. Apps will help predict timing, especially for busses. The MBTA has gotten much better about providing riders with real-time updates on wait times for the trains, but apps can also be helpful. There is an MBTA-endorsed Transit App, as well as others that riders find helpful like the MBTA Bus app. Hours of operation end between midnight and 1 a.m. Don’t wait until 1 a.m. to catch the last train or bus — you’ll likely miss it. Taking the T can help avoid traffic. 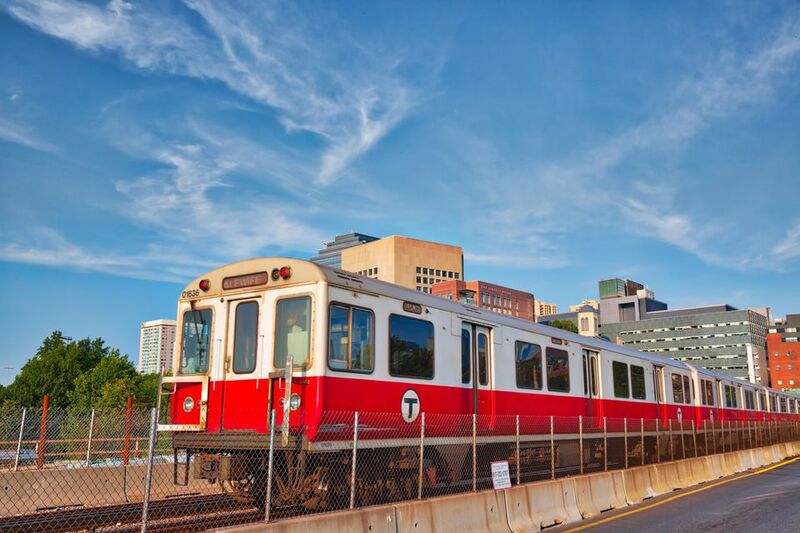 With the exception of the Green Line, which is above-ground for much of its path, the T is underground, helping you avoid traffic during peak hours. Avoid renting a car unless you plan to leave the city. You'll find it's both easier and more affordable, as public city parking can be hard to come by and expensive. Plan ahead to determine if your best bet is public transportation, walking or Uber/taxi. Google Maps comes in handy here, as you can play out your options to determine which will be faster. It really depends on where you are going and what day of the week or time you’re traveling. Think through the best MBTA pass to ensure you get the best cost savings. As mentioned earlier, this depends on how often you’ll be using public transportation, as well as what you plan to see while you’re in town and the number of days you’re visiting for. Compared to other major cities, the T is affordable. Keep that in mind if you’re used to NYC fares, for example. Again, do the math before deciding how to get around the city. Pay attention to inbound vs. outbound when taking the T. It’s easy to get caught riding in the wrong direction if you don’t look at the map and enter the station on the correct side.